Our human fascination with the Red Planet traces back to the 19th century, carrying on unwavering to the modern day. Of course, when the first Mariner spacecraft visited Mars in the 1960s, it found a desolate world. Ideas about martians faded away. But numerous spacecraft over the past 50-plus years, including orbiters, landers, and rovers, have uncovered an amazing planet that tells us a lot about the solar system. As nearby as our celestial neighbor might be, there’s nothing quite like seeing the features of Mars up close and personal. That’s why the Astronomy staff worked to bring you our Mars globe, a 12” desktop globe highlighting 206 of the planet’s most unique features. We are proud to unveil the greatest ever globe showing Mars’s surface — available exclusively from MyScienceShop.com. All of Mars’ most notable landforms are labeled, including the shield volcano Olympus Mons, the albedo feature Sinus Meridiani, and the dark spot Syrtis Major, as well as multiple spacecraft landing sites. The globe was produced using maps from the two Viking missions, as well as updated data from the Mars Orbiter Laser Altimeter (MOLA) aboard the Mars Global Surveyor (MGS). 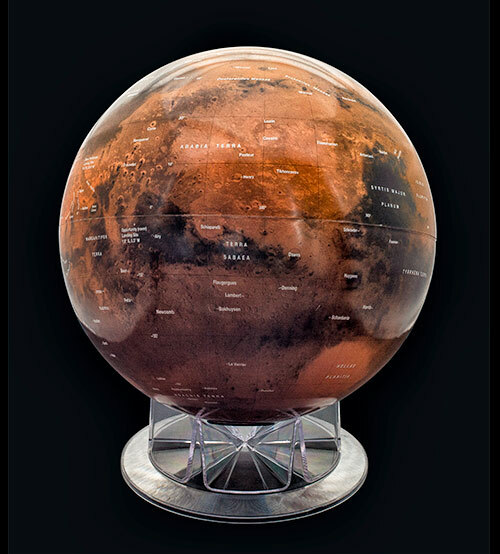 The injection-molded desktop globe shows the features of Mars in unprecedented detail and vibrant color. The free-mount style globe has only one seam connecting the two hemispheres and comes with a sturdy, 6-point clear acrylic base. It shows the entire surface of the planet, with numerous craters, basins, and valleys. If you’re an astronomy pro or hobbyist, you simply won’t want to be without this incredible new depiction of Mars, shown as never before. Pick up your Mars globe today and enjoy the celestial sights — and maybe even scope out some potential spots for the 2020 Mars rover exploration.